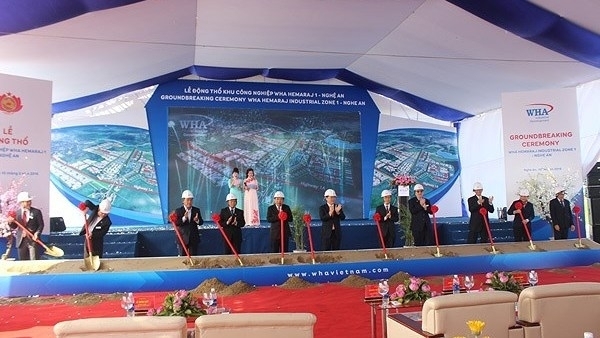 Deputy Prime Minister Vuong Dinh Hue attended a groundbreaking ceremony for the WHA Hemaraj Nghe An Industrial Zone project in the central province on March 10. This is an important project to attract investment in the province, marking the success of cooperation between the province and Hemaraj Group in particular and Thai enterprises in general. The project has a total investment of around VND22 trillion (nearly US$1 billion), covering an area of over 3,200ha in Nghi Loc and Dien Chau districts. The first phase of the project has an investment of US$92.2 million and an area of 498ha, aiming to build synchronous and modern infrastructure and prepare empty land to attract investors inside and outside the country. Once operational, the industrial zone is expected to create more jobs and improve incomes for locals, and help to shift the local economic structure and increase the proportion of industrial production in Nghe An.